The reason why conditional formatting is going away is because conditional formatting doesn’t work on error cells, and neither do charts. 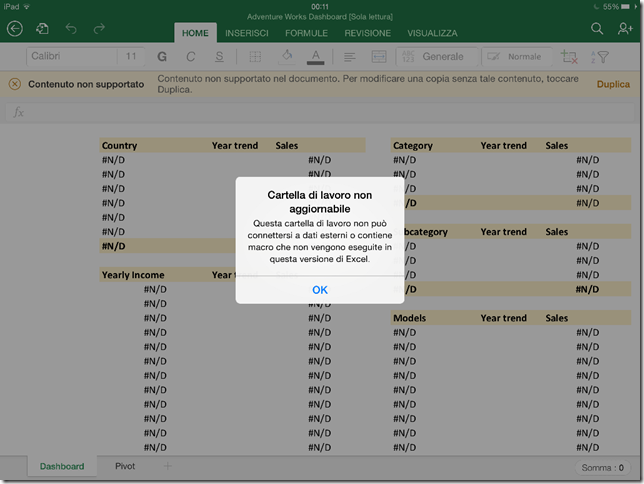 If opening the workbook the automatic recalc starts, every CUBE* function fails (it’s not supported on Excel for iPad, because of the lack of support for external data in this version of Excel) because they can’t fetch any data. At this point I wondered why the automatic recalc was happening, because I didn’t enabled such a condition in the Excel workbook. However, Dan’s explanation is: The reason it wasn’t happening for me is because Excel (all the Excel’s across all platforms) also have very complicated logic to determine when they need to recalculate. If you saved this from a previous version of Excel (earlier than 2013), or one of several other things occurred, we’ll recalculate it on open. In some cases where we feel it’s safe not to however, we don’t as a performance improvement. That’s what I was seeing. I am not sure that the different locale settings were the reason why automatic refresh was happening. However, when I set the calculation mode to Manual (Formulas ribbon –> Calculation Options –> Manual) the problem of automatic refresh went away, and I was able to open the workbook. 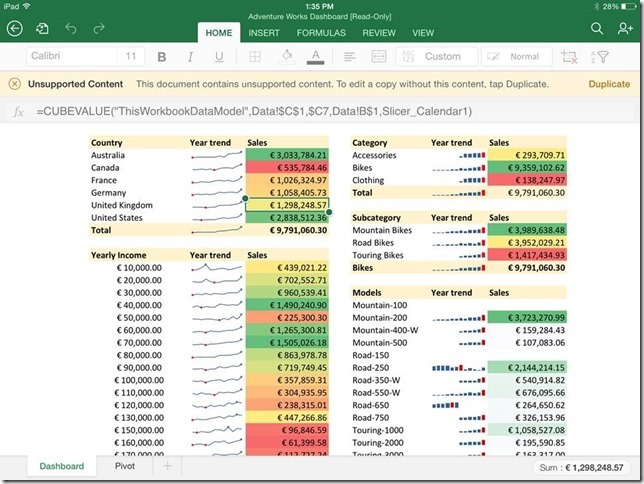 If you don’t want to rely on disabling automatic refresh (after all, changing the setting to Manual affect usability when you open the workbook from Excel on Windows), another approach is relying on GETPIVOTDATA functions instead of CUBE*. The operation can be time consuming, but in reality it’s not so different than using CUBE* functions if you start designing the dashboard in this way. This will be a topic for a future, longer article. But there is an interesting advantage of using GETPIVOTDATA if you use Power Pivot or Tabular: performance are better than CUBE* functions (the opposite is true for OLAP cubes).